ItemI-68249 - "Wood and English Lumber Mill, Eaglewood, Vancouver Island, BC"; Englewood, showing sawmill, log dump and a ship loading lumber; GR-0943. ItemI-68254 - Looking south through pass to head of Tsitika River from Klaklakama Lake; GR-0943. ItemI-68250 - Telegraph Bay sawmill; GR-0943. ItemI-68255 - Hemlock, silver fir on Eve River; GR-0943. ItemI-68265 - Establishing cache at Vernon Lake; GR-0943. 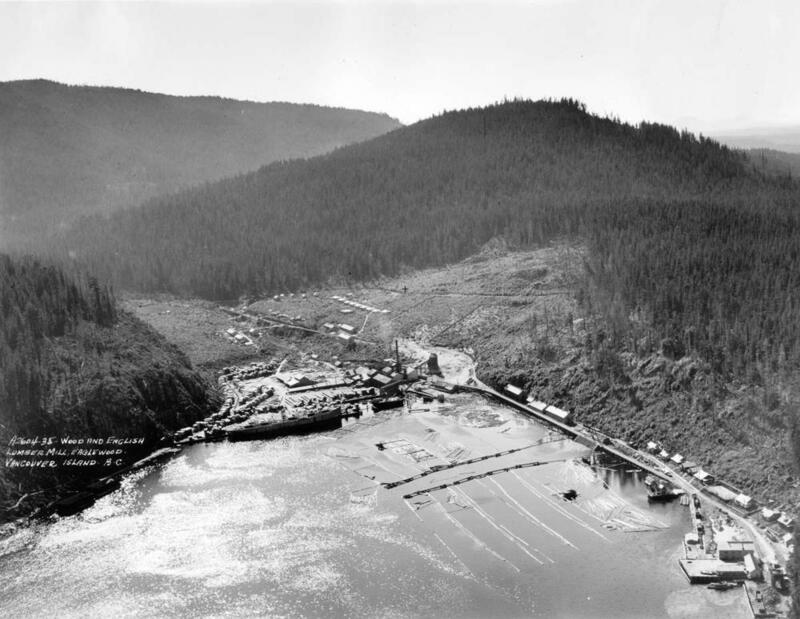 Item I-68249 - "Wood and English Lumber Mill, Eaglewood, Vancouver Island, BC"; Englewood, showing sawmill, log dump and a ship loading lumber; GR-0943.